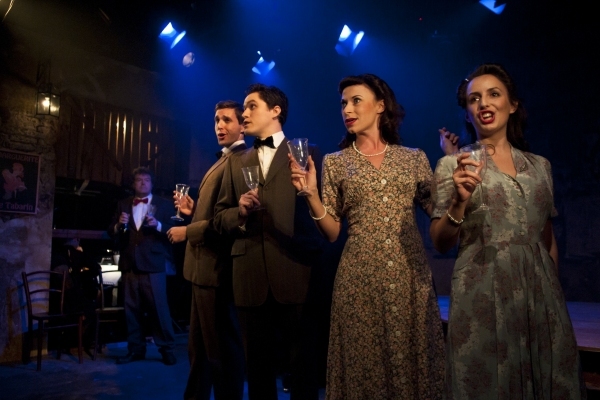 This new version of Marguerite at the tiny Tabard Theatre in Turnham Green seems to incorporate all the best elements of both the London and the Ostrava productions. The script has been pared down, with a shorter running time, but all the best songs have been retained along with two wonderful new songs that were written for Ostrava. This version was co-written by Alain and Guy Unsworth, who also directed the piece, and produced by Alex Parker, who doubled up as Musical Director. Jude Obermüller was responsible for orchestrating the the show as well as adapting elements of the score with the addition of new vocal arrangements. Marguerite is a much more sympathetic character and it is clear that she is with Otto as a means of survival rather than just for the luxuries in life. She is working as a singer in a small nightclub, the bar Tabarin, and in this intimate and atmospheric theatre space we feel as if we were actually part of her audience at the Tabarin. The role of Marguerite is superbly played by Yvette Robinson, who brings out all the nuances of emotion so powerfully and shows the fragility of the character. In ‘China Doll’, which has always been a wonderful metaphor for her situation, she stops singing at the moment she suddenly realises the words from her most famous song actually describe her now, and this adds a depth and self-awareness to her charater which makes her all the more interesting. One major plot difference from the London production is that Annette and Lucien are now brother and sister and Annette is in love with Armand. This funamentally changes the dynamics of the piece and adds extra complexity with a new love triangle. Also it is now Armand who has a Jewish grandmother and here that is taken one step further as his name is pointedly recognised as Jewish by both Georges and the French police officer. This makes Armand’s presence in Paris so much more dangerous and after his run in with the police it is only Annette’s quick thinking that saves the day, but it also forces him to leave Paris. Annette is a much more interesting character, she is loyal and feisty and seems to see more clearly than the other characters. The role is played by Zöe Doano with such charm and realism that at times I felt I was watching real life. The pain of unrequited love is beautifully shown in her singing one of the new songs ‘The Questions In Your Heart’, which has been brought forward to great effect. It encompasses the idea that love doesn’t let you choose and the inevitability of fate – concepts that have always been a powerful driving force in Alain and Claude-Michel’s work. The character of Otto is not the monster he was in Ostrava but more like he was in London. He clearly cares for Marguerite, albeit in a jealous and possessive way and at the end he is arrested, tellingly, by his previous collaborators, rather than shot, which has different implications in our feeling towards other characters. Georges now is a truly genuine character, who has a real affection and love for Marguerite and really cares for her. He comes across as a fatherly figure who tries to protect Marguerite and tries to warn her when she has gone to be with Armand, and Otto has returned sooner than expected. It gives us another character to like and care about and when we see his death at the hands of Otto it is truly shocking. Armand is probably the least changed character and here, well played by Nadim Naaman, he is an endearingly young romantic. The second new song is in fact called ‘A New Song’ and comes near the beginning of the second act. 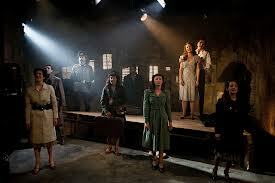 It is now one of the most memorable songs of the show with it’s sublime, heart-swelling melody. Here, sung by Armand rather than Marguerite, as it was in Ostrava, it is full of youthful joy and it’s easy to see how Marguerite is persuaded to start a new life with him. The final lines are sung in duet as they plan their life ahead and their sense of light-hearted fun makes the next scene with Otto all the more horrifying. Marguerite’s death is different from both London and Ostrava. After forcing her to write the letter of rejection to Armand, Otto keep her under control with drugs, which increasingly affect her so that finally she dies in Armand’s arms after taking an overdose. I think this works well as she chooses to free herself as Armand has freed Paris and she endearingly asks Armand to do for Annette what he has done for her: to make Annette smile. However I did find the strongest dramatic resolution was in Ostrava when she was accidently shot in cross fire after being reunited with Armand. It was the only ending that really made me cry. The song ‘Time Was When’ now opens the show and sets the scene in Paris wonderfully well and when it is reprieved at the end there is a real sense of completion. When Armand and Annette gaze, hand in hand, at the poster of Marguerite you know that he still loves her but that he can move on with his life with Annette by his side. With the seven piece band hidden off stage behind a screen, Max Dorey’s set design works atmospherically, with intriguing simplicity and improvised props. Together with Howard Hudson’s lighting design and Pete Malkin’s sound design the whole effect is to draw us in to Marguerite’s world and make it seem real. Convincing performances by Michael Onslow as Otto, James Darch as Lucien, Alastair Knights as Pierrot and Mark Turnball as Georges are well supported by a small but talented ensemble: Jennifer Rhodes, Helena Raeburn, Jessica Parker, James Meunier and Daniel Oliver. It is said that musicals are not written they are rewritten and with Marguerite each reworking has added something different. Alain and his wife, Marie Zamora, wrote a new version for Ostrava, of which many elements are retained in this latest version. There are fewer plot complications in the second act here than in Ostrava but it works perfectly well in the shorter running time. The simplicity of this smaller version adds a new dimension and a greater sense of realism and truth. It is perhaps strange that improvised props, such as a wooden crate for a table or chair can seem more real than the wonderful, sumptous London set. But the intimacy of the theatre space allows a real sense of witness to this incredibly moving and very memorable piece of theatre. I am sure it will have a future life and look forward to seeing how it develops.